Kyle was born on the island of Maui, and after graduating high school went off to Colorado State University to pursue a degree in Mechanical Engineering. Currently topics that interest him most are machine design and optimization of manufacturing processes. He dreams one day to work as a design engineer for a multinational company. 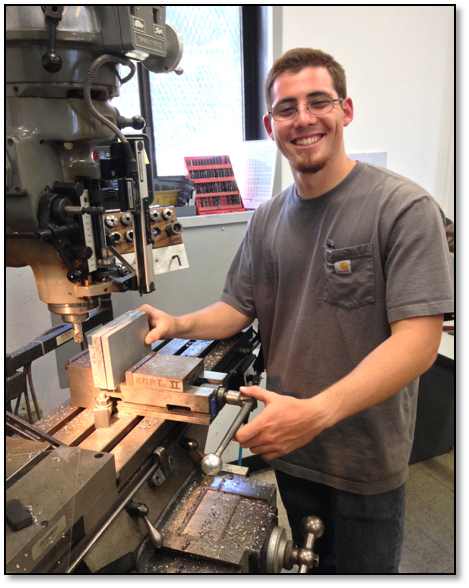 Besides engineering, Kyle enjoys the outdoors through activities such as spearfishing and archery hunting. As of right now the Canada-France-Hawaii 3.6-meter telescope does not currently park at true zenith, due in part to a misalignment between the declination pin and receiving block. This misalignment causes the pin to occasionally bind in the receiving block. Part of the problem is the air cylinder, which extends and retracts the pin, because it leaks, causing immeasurable losses in transferable power. This was be rectified by replacing the air cylinder with a new unit. By increasing the bore size of the air cylinder, roughly 25% more force will be exerted on the pin using the same air pressure. Additionally, we added updated position sensing switches to detect the location of the pin. State-of-the-art integrated sensing mounts have been designed and implemented for easy maintenance and troubleshooting in the future. All original, more rigid and robust mounting hardware was fabricated to keep the pin from becoming misaligned with the receiver. Long term, these improvements will make mirror exchanges and coating procedures more efficient, leading to less time, money, and stress being spent by Canada-France-Hawaii Telescope during the time sensitive mirror recoating process.